LAHORE: The Global Fund (GF), an international financing organisation, has pointed out alleged corruption and financial mismanagement in the Provincial TB Control Programme (PTP) Punjab. 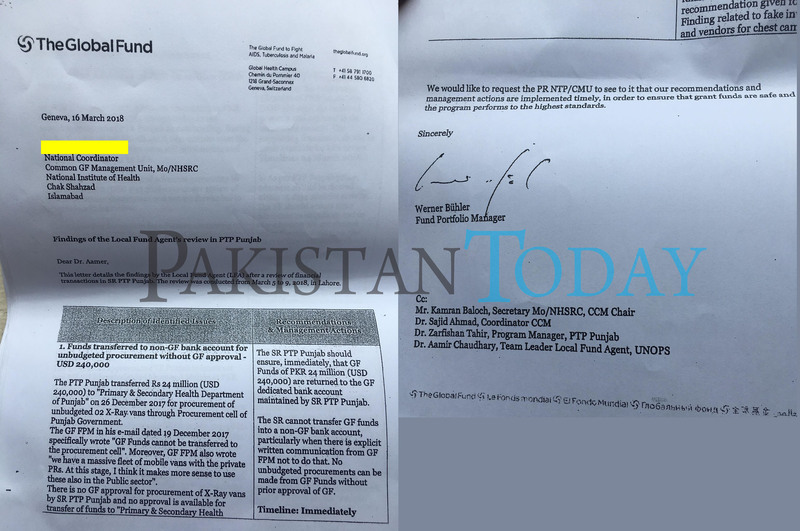 In a letter sent to the National Institute of Health (NIH) Executive Director Brigadier Dr Aamer Ikram, GF’s Fund Portfolio Manager (FPM) Werner Buhler has detailed the findings of the organisation’s local fund agent (LFA) after a review of financial transactions in PTP. GF pointed out that PTP Punjab transferred Rs24 million to provincial Primary and Secondary Health Department (PSHD) for the procurement of x-ray vans through the Punjab Procurement Cell (PPC). The LFA’s report said that GF had not given approval for the procurement of these vans and nor had it approved the transfer of money to PSHD. It also pointed out that the GF’s FPM specifically said in an email to the PTP that “GF funds cannot be transferred to the procurement cell”. The report revealed that GF had granted approval to PTP to construct two BSL-3 laboratories in Multan and Lahore at Rs11.2 million each, however, PTP only constructed one laboratory at Rs16.1 million. The report further revealed that the contract was awarded at Rs9.9 million to “bring the sum into the signatory threshold of the PTP manager”. The increase in cost is due to “undocumented” works, the report also said. 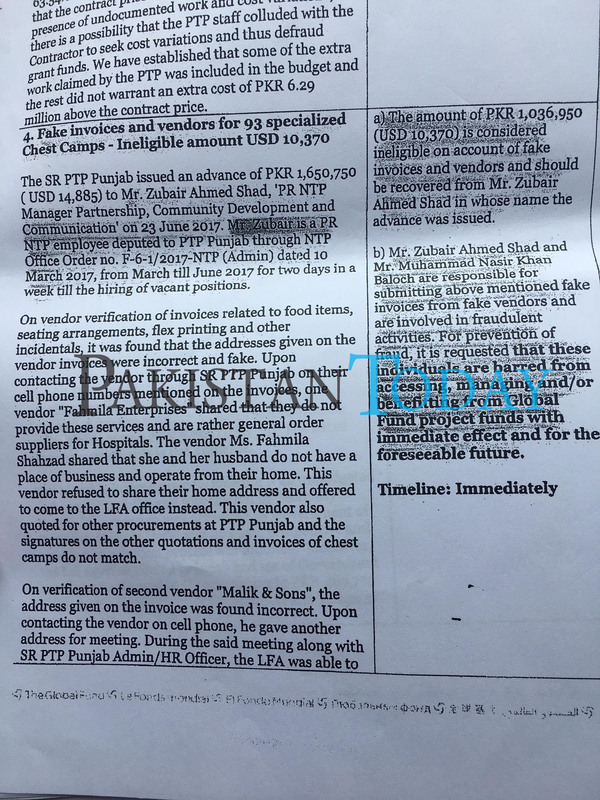 The LFA’s report also highlighted that “fake invoices” from “fake vendors” amounting to Rs1.03 million were submitted by PTP Manager Communications and Advocacy (MCA) Zubair Ahmed Shad and PTP Partnership Development Officer Nasir Khan Baloch after PTP issued an advance of Rs1.6 million to Shad. 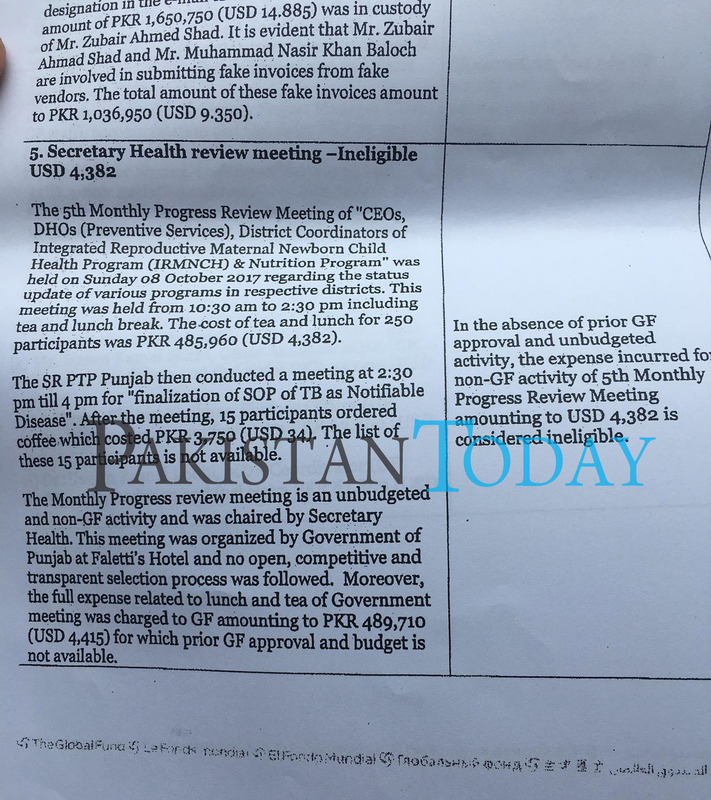 GF’s report further revealed that a monthly progress review meeting was chaired by the Punjab health secretary at Faletti’s Hotel without approval from GF and “the full expense related to lunch and tea of government meeting was charged to GF”, which amounted to Rs0.48 million. 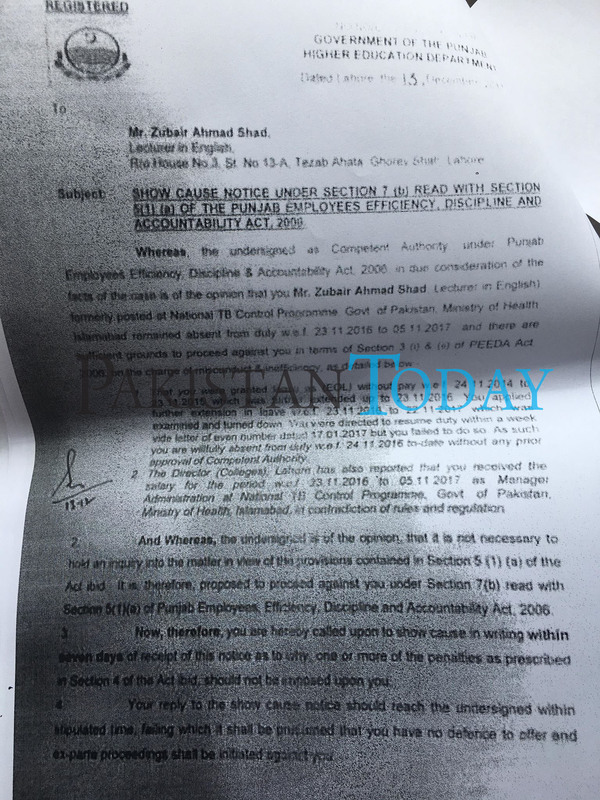 Upon instructions from the PSHD secretary, a health week was organised without approval from GF, according to the report. 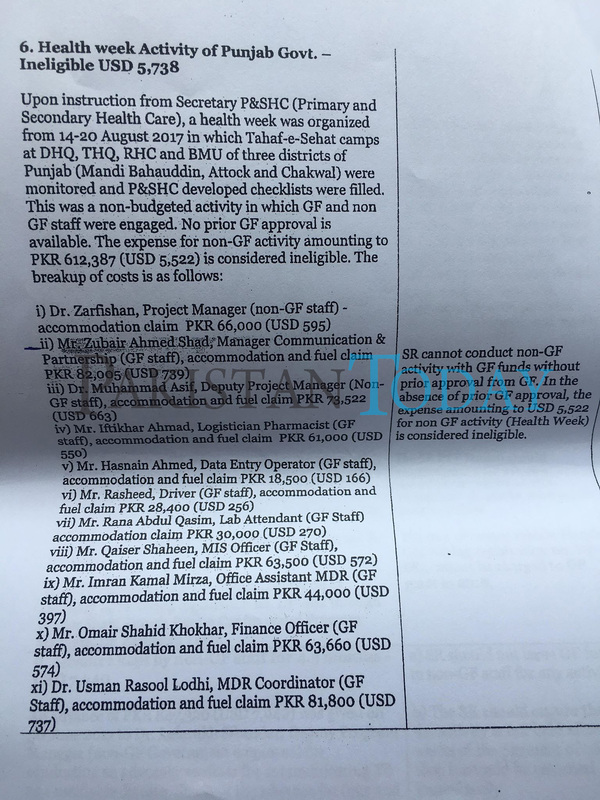 The report further outlines that in light of the health week, Project Manager Dr Zarfishan claimed Rs 66,000 for accommodation, PTP MCA Zubair Ahmed Shad claimed Rs 82,000 for accommodation and fuel and Deputy Project Manager Dr Muhammad Asif claimed Rs 73,000 for fuel and accommodation. “The LFA threatened and harassed our employees,” she added. 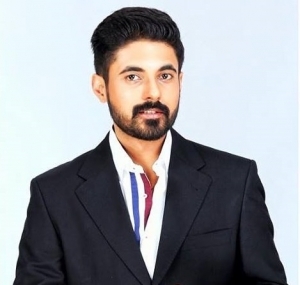 Pakistan Today tried repeatedly to get in touch with the Punjab health secretary but he was unavailable for comment. 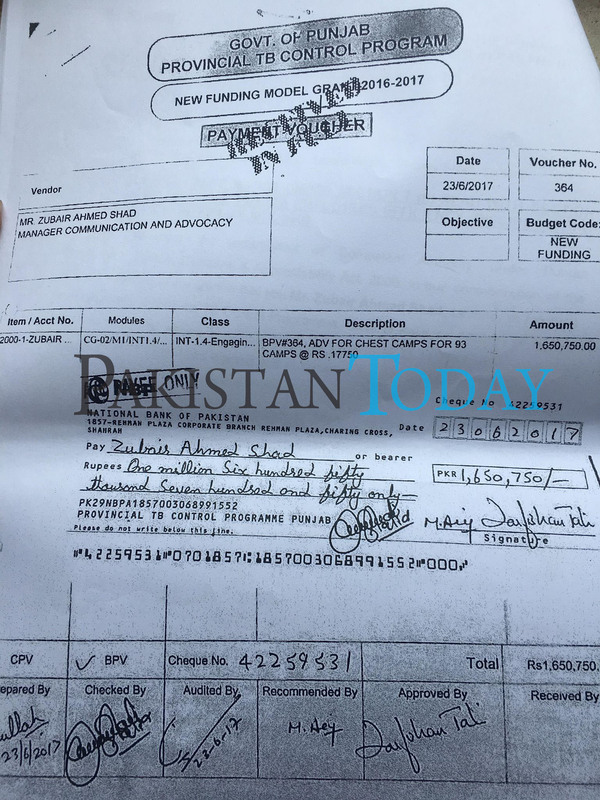 Dr Zarfishan claimed that she had a letter which proved that GF’s report was biased and she would share it with Pakistan Today. However, she did not provide any material in support of her claim by the time this report was made.